on the show): Don Pardo. producers and creators of adult TV game shows Mark Goodson and Bill Todman ever created and the only kids TV game program that Gene Rayburn ever mc'd on TV. 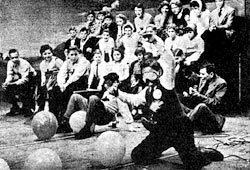 In the photo, Mr. Rayburn is leading the teams in a zany stunt, where they try to pop balloons while blindfolded. The show was broadcast live from The Hudson Theater in NYC.